The title, as the reader discovers in the concluding chapter, is apt. The story begins with a family reunion of sorts: Ruth and her two children Giordana and Ben have moved in with Natalie and Peter and their sons Alek and Sasha because Ruth has left her husband. Giordana’s is the first of multiple perspectives, each revealing events from their own point-of-view, from different points in the family’s timeline. 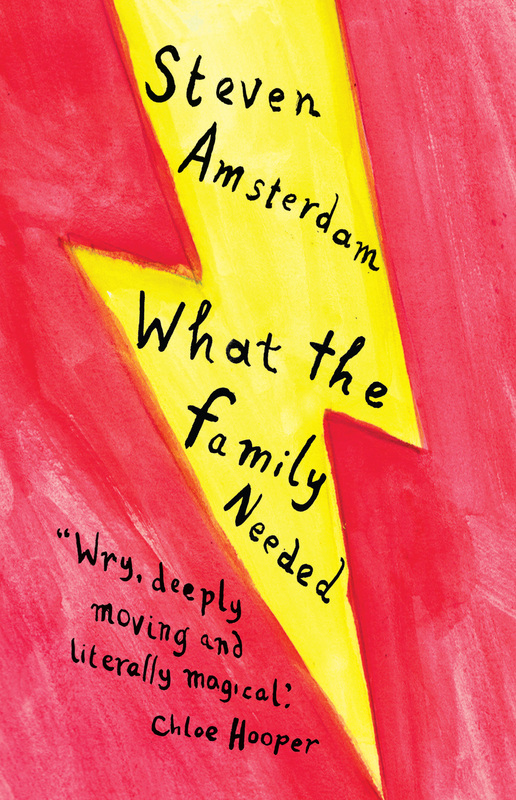 But from the normalcy of family life Amsterdam weaves a little magic: each character has a special gift, one that challenges the reader’s view of reality. Giordana, for example, can become invisible, as and when she pleases. This invisibility is not like H.G.Wells’ The Invisible Man , where invisibility is an irreversible curse that’s a catalyst for crime. Griffin’s self-inflicted condition leaves him with few choices: invisible, he is a victim of small town rejection of anything that’s different, and then he is betrayed. Amsterdam’s riff on this idea from Plato’s Ring of Gyges in The Republic is more sophisticated and more morally complex. The Ring of Gyges is a parable which reveals how people would behave morally if they had no fear of being caught out. Amsterdam asks, how would a teenage girl behave if she could eavesdrop on household conversations, overhear those uncensored adult discussions or follow an older sibling on a romantic assignation? How would a middle-aged woman use her knowledge of the innermost thoughts of other people, in her work as a palliative care nurse or in her own love life? Would a troubled soul who could fly, soar away never to return – or is there a homing instinct? Would it be satisfying to change the past to ease regret? It is the chapter about Peter, lost in a morass of grief after the sudden death of his wife, that moved me most. Peter receives what he thinks is a senseless gift: he can wish for peaches out of season, but not for the one thing he really wants. Peter nodded once, to let her know that it was all right if she did. Natalie used to put it on for gardening. It mystified him, but she always managed to keep it spotless. Would he be able to stand it if Ruth wore it till it was stained and moth-eaten? If she didn’t take it, could he let it go to the Salvation Army – that recycler of lives? Yes, yes. He tried to consider it all. The clothes were there, they were connected to Natalie, but they weren’t her. He saw each garment in crisp detail. They didn’t make her her, any more than Peter had – or any more than she had made him him. Peter had not been her conductor and Natalie had not been his. This was the clarity he had been waiting for. You live your life adjusting the notes, meddling with tempos. You silence the brass, chase crescendos, but only you get to be the conductor. They had stood next to each other on different podiums, waving their little sticks for all those years. This is true wisdom, and the imagery is perfect. Amsterdam’s characterisation shifts across generations with authentic portraits. Giordana’s perspective is darkly comic, self-deprecating and wry, as an adolescent view of the world often is; Ruth’s middle-aged persona is self-doubting yet professionally confident. The passage of time is lightly sketched: Amsterdam has an impressionist style that avoids cumbersome detail. This book has been widely reviewed. Cate Kennedy at The Monthly enjoyed Amsterdam’s ‘ferocious intelligence and playful curiosity’; Greg Day at the SMH had reservations about its ambiguities. You can find out more about Steven Amsterdam here. Great review Lisa sounds like a fascinating story, I’m going to have to get this one :) Also, from my own thoughts it is a reminder to me in trying to write my own novel, to slow down and take the time to write it how I wish to and to do the best job that I can and not be in so much of a hurry as to short change a good story. Here’s hoping. Yes! Let the story tell itself – I read just recently somewhere that characters often seem to have a ‘mind of their own’ and won’t let the author steer them in a direction they don’t want to go. I find this even when I’m writing reviews, that they take off in a direction that wasn’t there when I first began writing, and I just have to take the time to let those thoughts sort themselves out. Sleepers Pub. That’s a good tip! haha. Thanks for your excellent review. The quote would be enough to convince me to read the book, but you add so much more–including other book suggestions which I love. Hi, not being constrained by space is one of the big advantages of blog reviews…it’s lovely to be able to show the author’s style with a quotation, the hard part is always choosing which one! I agree with mdbrady, the quote is a wonderful enticement. The idea that we adjust notes and melodies, waving our little sticks on individual podiums in order to live in harmony is beautiful. And beautifully written by Amsterdam. Thanks, Karen – woudn’t this make a nice quotation for a wedding ceremony! Oh absolutely. I can picture the scene. I might have to write it into a novel one day. Only two people at Sleepers! I had no idea, that makes the quality of what they do even more amazing. I did so love Glissando by David Musgrave and The Philanthropist by John Tesearch was a wonderful debut novel too. Great review, Lisa. Amsterdam is a supremely talented, and empathetic, writer. Wait until you see how different his first book is. I’m a fan of both of them but the first is still my favourite (but I think that’s purely a personal thing, I find the themes fascinating). I’m glad you’re reading him. It is so true, your comment in your review, (http://wp.me/1Pr54 that the ‘poignancy of this novel really sneaks up on you’ – and IMO that makes it all the more effective. Before you know it, the plot connects with some aspect of your own life, and the emotional impact is stunning. PS My spies tell me that they enjoyed the session you chaired at the SWF! I read this for book club last month, and we had a big debate about whether we thought the ending was happy or sad. A few of us thought it was happy, but most of us found it horribly depressing. Depressing? How interesting! I hadn’t thought of it like that at all. Why did it feel that way? Everyone who hasn’t read it should look away now. SPOILERS. That final sequence with Alek, where he’s rebuilding the world around him so it looks like he was a “good” son – I found that really sad. That you have to deny an inherent part of yourself to make your family happy is a really depressing thought. Ah. I see. There were other aspects of that chapter, especially his regrets about, a-hem, a certain major intervention, that provide food for thought. But I can see why your group disagreed about it: I felt that he had reached a kind of accommodation, and that his family, clumsy though their efforts were, had too. I liked the way Dad in particular stumbled towards letting go of his rigid expectations, even though you could see him messing it up sometimes. It’s hard for parents to let go of their dreams too. I can see that I must dig out my copy of Things We Didn’t Coming before too much longer!